SANTO DOMINGO, Dominican Republic (CNS) — Pope Francis’ visit to Cuba and the United States comes as people and politicians in both countries increasingly support ending an economic embargo that has been in place for more than five decades. “Our extensive experience with transitions from communism has shown that economic opening and diplomatic engagement do not automatically lead to political freedom,” Sen. Marco Rubio, R-Florida, outspoken supporter of the embargo, wrote in an op-ed in The New York Times in July. But the pope is unlikely to wade into specific policy matters, Archbishop Thomas G. Wenski of Miami said in an appearance on “This Week in South Florida” Sept. 13. Pope Francis’ visit comes as polls in Cuba and the United States show public support growing for doing away with the embargo. A Pew Research Center poll of 2,002 adults conducted July 14-20 found that 72 percent of respondents — including 59 percent of Republicans — favored ending the trade embargo, up from 66 percent in January. A March poll conducted for Univision Noticias found 96 percent of Cuban adults surveyed were against the embargo, or “bloqueo” as it’s called there, and that Obama and Pope Francis were tied as the most popular figures. Havana Cardinal Jaime Ortega Alamino said that, in March 2014, Pope Francis told Obama that “Latin America is united against the embargo” and that lifting it would help the U.S. improve relations with countries in the region. “The pope spoke about the embargo to Obama, and he told him that it was a totally obsolete measure that was put in place before (Obama) was born,” according to an interview with Cardinal Ortega published on the Havana archdiocesan website. Members of Congress have responded to Obama’s calls for the embargo to end with numerous bills, including a bipartisan measure introduced in July by Reps. Tom Emmer, R-Minnesota, and Kathy Castor, D-Florida. That bill, however, and a handful of others that deal with the embargo have failed to make it out of subcommittees. 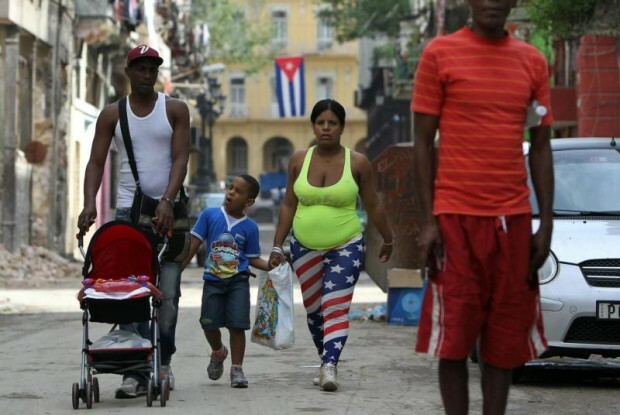 As for the embargo, “There’s nothing Cuba can do about that,” Josefina Vidal, the Cuban Foreign Ministry’s chief of U.S. affairs, told reporters in early September. Ezra Fieser will be covering Pope Francis in Cuba. Follow him on Twitter: @ezrafieser.